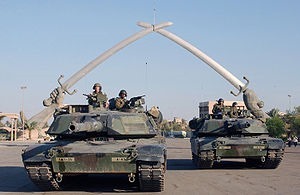 So, if you knew, 10 years ago, what Iraq looked today, and what it took to get here, would you support the war? I mean this seriously, even if the answers is almost certainly no, because Iraq is a better place today than it was then. The shaky Maliki government is definitely an improvement on Saddam; I don’t think that is up for much debate and should be admitted. The question is whether it was worth the cost. And the cost should include the roughly 125,000 Iraqi civilians killed. I find American pundits tend to focus solely on the much smaller number of US casualties, which is deeply inappropriate. For myself, the answer is no. And I bet that is the opinion of over 90% of IR. I have no data for that intuition, but, as Brooks, Ikenberry, and Wohlforth just noted, IR as a discipline seems to strongly support US retrenchment today, and much of that is because of the Iraq War. I think this is still accurate. We didn’t oppose the war as well as we probably should have, but we did turn against it pretty quickly – certainly sooner than the pundit class. Does that mean we ‘saw the light,’ or just that we are fair weather hawks? Neocons will surely accuse us of the latter – academic wimps unwilling to see through our convictions. I think IR bears a special burden for the US use of force overseas, because, more than any other identifiable section of academia, we study that. Yes, the DC think-tanks also work in this area, as do diplomatic historians. But at the risk of cheerleading for our discipline, I believe IR conducts more basic research than these other two, and we’re far less co-opted than the think-tank set. We generate a lot of deep theory about how world politics works, particularly on the causes and consequences of war. Furthermore, a lot of us study US foreign policy specifically – just go open an random copy of International Security to see how much ‘America’ actually dominates our supposedly ‘international’ discipline. So if there is anyone who should know what they are talking about, it should be us, right? If we can’t pronounce meaningfully on our country’s choices regarding force after 60 year of studying this stuff, then wth are we being paid for? And in fact, I am willing to bet that most of us were asked 10 years ago what we thought about the coming invasion by people who respected our opinion because of our supposed expertise. You probably talked at least to your family and friends, and they listened attentively. You probably changed a few minds. Again, this is what we do, right? It is of course true that the policy world doesn’t really consult us in-depth on lots of foreign policy decisions, and certainly the GOP, which genuinely relishes blowing off academics as lefty egg-heads, doesn’t give a damn what we think. But as teachers, we do obviously impact the debate at the grassroots level. At the very least, we probably helped convince our family, friends, students, etc. Every class we taught all across the country where this inevitably came up, every panel we sat on, every local media appearance we made, etc. – all that helped shape the public discourse from below. As Fallows notes, there was a lot of silence and ‘soft complicity’ (my term) in 2002 from journalism and academia, because we didn’t speak up louder even though the data that Saddam was a threat to the US homeland were weak, and even though we had lots of good theories that predict social chaos in decapitated, deeply divided societies. It’s true there was little enthusiasm and a lot of hemming-and-hawing from us, but there was little clear opposition. All of this is to suggest that we probably did a poor job at providing the needed pushback to the 2002 Bush-Cheney campaign for the war. As Drezner notes, the exculpatory out we’ve always used – that 80% of us opposed the war – is based on a survey take in 2005. Consonant with Drezner’s recollections, my own memory too is that colleagues in IR were hesitantly supportive at the time. But then I was still in grad school, so I don’t have the sense of what was going on at APSA and ISA as much as others will. (Please speak to this point in the comments if you are able.) But at least at Ohio State, where I was at the time, I don’t remember a meaningful PS/IR effort to oppose the war. For myself, I must admit that I supported the war at the time – arguably the greatest professional error in my career (not that my opinion means much, but still, in the interest of full disclosure). On the other hand, there was (thankfully!) that New York Times ad in which 33 big names in security studies argued against the war in September 2002. Also, Walt and Mearsheimer also put out a Foreign Policy piece against the war in January 2003. Indeed, reading these two pieces today, I am impressed how prescient they were. Here’s Walt’s own 10-year retrospective now. He’s admirably restrained; imagine the neocon gloating and chest-thumping about wimpy academic liberals who don’t know the real world of blood and iron had they been right. Ech – where’s Donald Rumsfeld to yell at the media when you need him? (Indeed, it’s amazing how Krauthammer and all the rest still command a huge audience despite their continued unrepentance; is America that hawkish?) Finally this much wider group of ‘Security Scholars for a Sensible Foreign Policy’ argued for more restraint as early as 2004, presumably also motivated heavily by Iraq. Duck of Minerva (an IR blog where I also write) was very heavily involved in that. There was a formal academic write-up as well. But of course, that was after the war began to go off course. On that score, Walt and Mearsheimer’s gutsy pre-war stand is particularly noteworthy. Finally, all this then raises the question of how we should respond to efforts to confront Iran. My own sense is that IR almost monolithically opposed to that too, but we aren’t really saying much about that either. Is that a mistake? Are supposed to be more engaged in policy? Should we circulate an open letter? I don’t know of any effort to do so. This entry was posted in Academia, Foreign Policy, International Relations Theory, Iraq, Middle East, Political Science, Terrorism by Robert E Kelly. Bookmark the permalink. Wonderful post. I learn a great deal about the discipline. I suppose, though, that part of IR engages in analyzing past events and only part of it is prescriptive or predictive, no? Perhaps it’s a thoughtful self-examination of IR’s complicity in the war, but it’s not unreasonable to say that IR specialists couldn’t have realistically been able to disentangle justifications for the war (jus ad bellum) from conduct during the war (jus in bello) in 2003. How would they have known how things would turn out? And how can you know now only 10 years later? Someone asked a Chinese communist party member (you would likely know the story) whether the French revolution was a success, and he answered that it was too soon to tell. I would say that judgments on the Iraq war are probably still speculative and it’s not dishonest to take such a position. I would be interested in your take on the argument that the Arab spring would be very unlikely to have happened without the Iraq war. A paper on this sort of war guilt among academics comparing Iraq to WWII Germany or Japan’s experience might be very interesting. My sense of the argument that Iraq 2 helped foment Arab Spring is that it is a desperate grasping at straws for vindication by those who supported the war. I’ve not actually seen any research documenting causality from the war to the regional revolt. That doesn’t mean it’s not true – only that the conflict of interest of, say, AEI telling us that Iraq 2 and Arab Spring are causally-related is simply too egregious to ignore. What do you think? So far as I know it was a Thomas Friedman column where he claims that the realization that dictators may be removed, and perhaps the lack of material support from Iraq to other autocratic governments made a difference. I don’t know. Again, I feel that it’s far too early to assess whether Iraq 2 was on the whole beneficial. And what sort of metric can we construct for these judgments anyway? We still do not agree whether the Crusades helped or harmed Europe. But I do see now that the question of whether Iraq 2 was a “good” war is in one sense perhaps irrelevant to the question of whether IR academics should feel culpable for passively or actively going along with it. Academics abetted a war fought for spurious claims, whatever the long-term results. Scholars in Germany or Japan post-war had excuses as well that they were under pressure, afraid, seduced by the war-drum, had insufficient information, made honest mistakes, and I think in fairness these explanations are part rationalization and part truth and apply to Iraq as well. I also don’t see people outside IR holding a grudge against academics for making these statements, as the public did the same. As to your own feelings, I do not know your age, but I expect that yours is close to mine (early 40s). I initially supported the war because I had just been essentially forced out of Canada because of student loans and I was bitter toward my own country. Canada never explicitly refused to fight in Iraq 2 but rather made the excuse that they didn’t have the military resources, which I thought (and still think) was cowardly; take a stand, dammit, one way or another. At least France stood for something! This made U.S. actions seem more honest to me, maybe. We are all ten years older now and perhaps we need to forgive our younger selves. To this day I have yet to comprehend why the administration didn’t have the foresight to prepare for a counter-insurgency from the beginning (see History). Why they didn’t have enough active duty troops to secure Iraq. Why they didn’t secure the Syrian/Iraq/Iran border from the beginning (did they not realize that jihadist fighters would flow in – see Afghanistan circa 1980’s). Why didn’t they have in place, enough Arab speakers with intimate knowledge of Iraq. What was their post war Iraq political strategy? Who was planning this war? And if you are incapable of providing these very important requirements then don’t go. SIMPLE. War is not an enterprise that should be done half fast. You go all in or not at all. It seems as if the administration didn’t read Trinquier, Galula, Che, Clausewitz, Jomini, etc., until 2006 or so. This is no Monday morning QBing here. Anyone who matriculated in any credible military history/military philosophy-theory program would be asking these same questions. Problem is that many of us thought that those in charge were as learned and educated in these matters as the stars they wore indicated (actually, General Powell was the exception, he understood). I heard a British saying about war once, it goes something like this, ‘If you go to war for the wrong reasons but do it right, people will get mad at first but they will get over it, however if you go to war for the wrong reasons and mess it up, people won’t get over it.’ I am not saying that the reasons for the Iraq War were right or wrong, I tend to shy away from normative arguments. I still think however, that we don’t know enough in that regard. A good piece of advice from the British nonethless. Maybe you could invite a high ranking Officer and a high ranking Staff NCO to speak to your class as well. Thank you for the post. In parting let me say that I do think that there should be more cross training betwen IR and Military Theory Specialists. I think this is good. As you say, I assumed that the Bush people knew what they were doing. To be sure, I didn’t really think about that too much before the war. I think, like everyone else, I just sorta expected the UN or the EU to clean up the mess. Also, it’s not entirely fair to blame the Bush administration for everything that went wrong. War is obviously chaotic and opens up all sorts of unexpected/unanticipated problems. But these points aside, I am just amazed, horrified, in retrospect how little planning went into this. It became appallingly apparent that the Bush people really had no plan for what to do with Iraq after the shooting stopped. That is where the heaviest weight of culpability must fall. Yes, the public didn’t probe enough, and journalists and academics who knew more carry a special responsibility for not pushing harder in 2002. Hence this post. But we all vaguely assumed the Bush people knew what they were doing. We had no idea just how incompetent they were. I’ve always thought there was a defensible (not great, but defensible) rationale for the war. It was the execution – god-awful, incomptent, mismanagned, using torture, etc. – that stripped the project of any moral claim. Professor, thank you for a great post. Look forward to reading part 2. Also, congratulation on your successes and wishing you many more to come. You sure have put in your academic ‘grunt’ time. I think that you would be a good fit at CATO one of these days.